Washington and Lee University includes an undergraduate campus and the Washington and Lee University School of Law. W&L offers 1,200 courses, 37 majors, and 30 minors. See the full list of academic departments and programs here. The undergraduate campus includes the College of Arts and Sciences and the Williams School of Commerce, Economics and Politics. The average class size is 15 students; the student-to-faculty ratio is 8:1. The immersive Spring Term allows students to take one unique course for four weeks, exploring a topic in-depth on-campus or abroad. Past Spring Term courses have included the Physics of Music, Cross-Cultural Documentary Filmmaking, Medicine & Research, and the Science of Cooking in Italy. 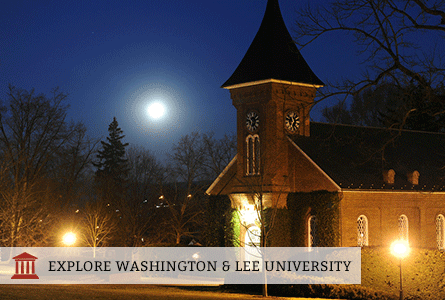 Washington and Lee features the only fully-accredited business school and fully-accredited journalism program among the nation's top-tier liberal arts colleges. Students can pursue undergraduate degrees in Engineering, and Integrated Engineering, which includes courses in Biology, Chemistry, Computer Science, and Geology. Receive pre-professional advising if you plan to pursue the health professions or law. You can also receive support if you plan to apply to fellowships or research opportunities.